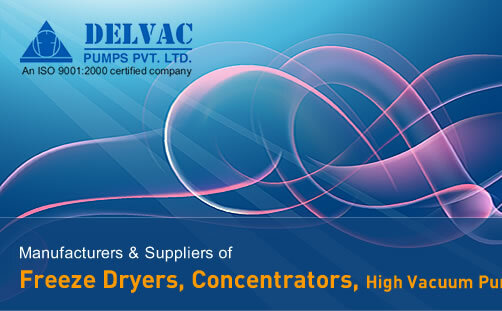 Dryers India, Ampoule freeze dryins, Vial Stooperlins Machine, Glycol bath India, Lyophilizer India, Delvac Pumps, Food Processing, Ultra low freezer, Lab equipment, Lyodel Freeze dryer - Delvac Pumps Ltd, Chennai, India. 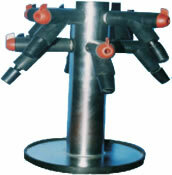 8-Port or 24-Port Column Manifold is useful for drying of small volume of liquids in flasks. It is provided with quick seal valves for holding flasks up to 1 litre capacity. Manifold sealing gaskets and cone connectors are also supplied with this accessory. Stainless Steel Drum Manifold is available in 12 as well 16-Port versions. Each port is supplied with quick seal valve for holding flasks. Top and bottom manifold sealing gaskets are also provided. Drum manifolds are also useful for bulk drying in trays and beakers inside the drum. 8 - Port Acrylic Drum Manifold can be used with all three models of Lyodel.Manifold sealing gaskets are also supplied with this accessory. 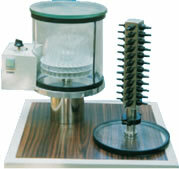 Spin Freezer is useful for freezing & primary drying of samples in glass ampoules. By spinning ampoules, samples are frozen on the base unit without the need for pre-freezing. The centrifugal force holds the liquid sample in position and prevents frothing and bubbling during evaporation as the sample solidifies and sublimes. The spin freezer has an independent power supply and includes a timer to prevent spinner overrun after freezing. Removable rotor plates provided with system accept 5 different sized ampoules. To complete the cycle and seal ampoules in the best possible condition, secondary drying manifold is used. 48-Port Manifold can be doubled to hold 96 ampoules by using the additional manifold supplied with a 'T' piece for connection. Simple hand held Ampoule Sealing Torch is useful for flame sealing freeze dried ampoules under vacuum in combination with secondary drying manifold. This Torch does not require conventional gas cylinders or long hoses. Vial Stoppering Shelf with 4 shelves & 8 trays. The basic function of this manually operated isolation valve is to isolate the drying accessory and sample from the ice condenser and pump. This is also useful in injecting inert gas before sealing the vials and for determining the dryness of the sample by measuring the vapour pressure in the drying accessory. The system has acrylic vacuum chamber with lid and upto five shelf rack assembly and trays. The acrylic vacuum chamber gives a clear view of the product and transmits radiant heat energy for drying. It is easily sealed by drop on acrylic lid with lead through for heater accessories. A conveniently designed rack supports up to 5 one litre stainless steel trays, and is ready wired to accept low voltage, heater pads under each tray. The design allows selection of any tray & heater combination for maximum utilization. It can be easily lifted in and out of freezer units. 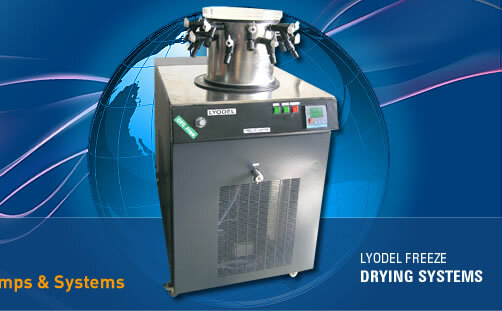 This system can also be used with temperature control unit for careful control of drying rate. The heater control unit is a freestanding power supply unit designed to deliver a thermostatically controlled low voltage power supply to the heaters. The heat energy produced by the heater mat under each shelf enhances the drying rate.